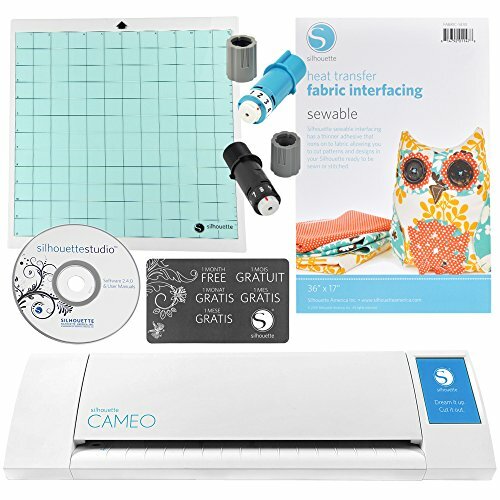 Use the fabric interfacing kit to cut detailed fabric that will be sewn onto clothes, quilts, and other soft surfaces. Sewable interfacing has a thinner adhesive that irons onto fabric. The cutouts can be temporarily adhered to a project while they are sewn or stitched into place. The new Silhouette Cameo has the same sleek design and the same precise cutting but just got even better. The new digital display features a full-color LCD touch screen for step-by-step tutorials and easy navigation. The new built-in crosscutter allows you to cut materials that have been fed directly from a roll and give a perfect edge. All Silhouette machines have a built-in optic scanner capable of reading printed materials. PixScan technology is a new feature that allows you to cut around a printed design using a scanner, camera, smartphone, or tablet. You can find over 50,000 downloadable design in the Silhouette Design Store. With the Design Store, you only pay for the designs you really want. The CAMEOs Print & Cut feature lets you cut precisely around designs and images you have printed on your home printer. Perfect for making stickers, printed iron-ons, and much more. If you have any questions about this product by Silhouette, contact us by completing and submitting the form below. If you are looking for a specif part number, please include it with your message.